We live in a game of the mind. We name and give adjectives to the reality that surrounds us, giving it attributes that limit our ability to perceive it. If we talk about the moon, we create a conditioned and limited vision of the moon in the mind. And if somebody shows it to us, as the famous saying goes: "all we'll see is what the finger points at." 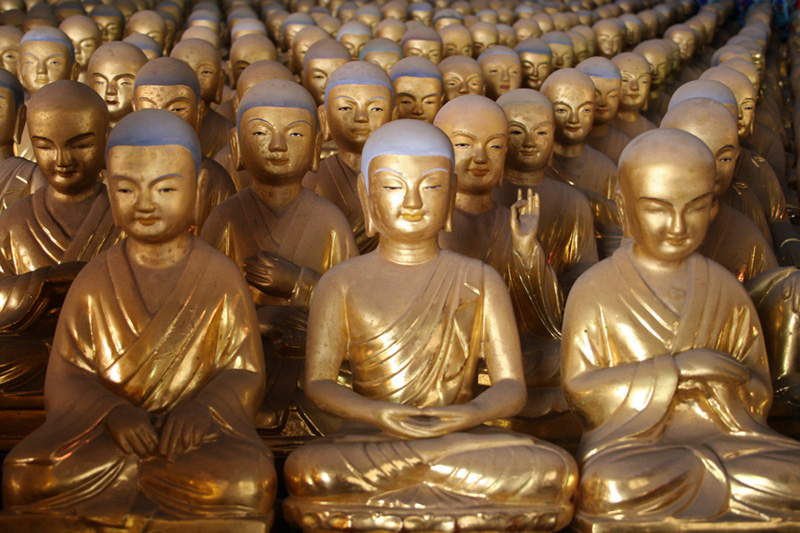 When Siddartha Gautama left his princely life, he did so to understand the origin of suffering and remedy it. In his introspective work he realized that our search for security, in a constantly changing reality, is like trying to hold soap bubbles. 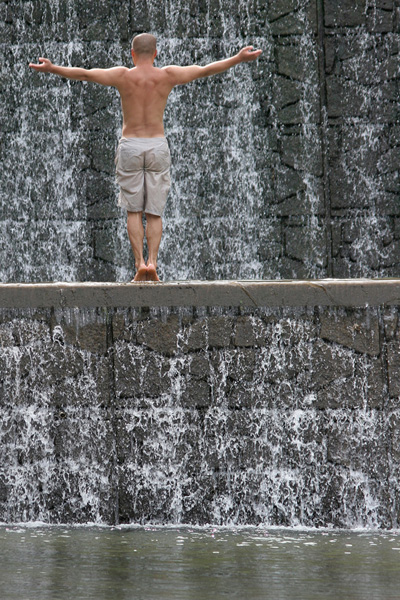 The desire and the eagerness of possession, makes us constantly fall into our cycle of suffering. 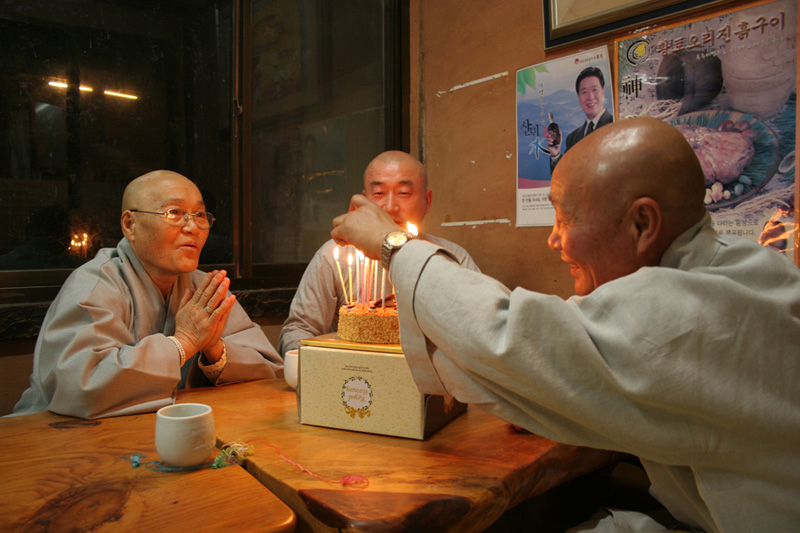 Buddhists traditionally consider monastic life as one of the most favorable environments to progress towards enlightenment. 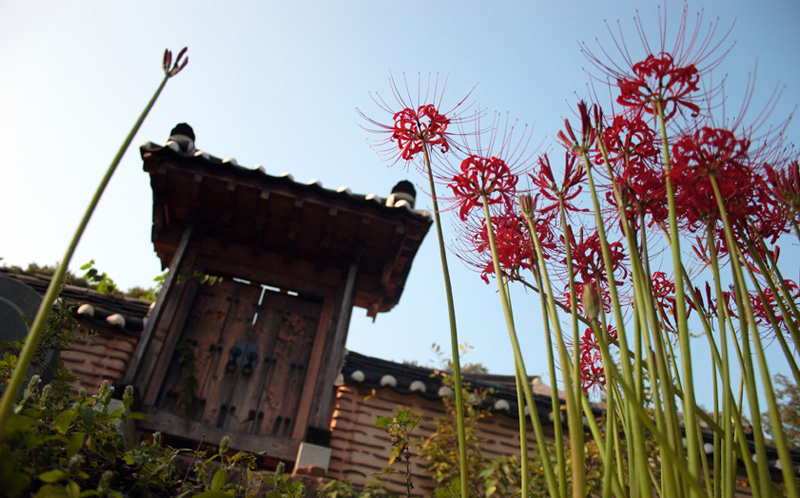 Korean Zen monasteries are usually located in proper places according to oriental geomancy: Feng-Shui. 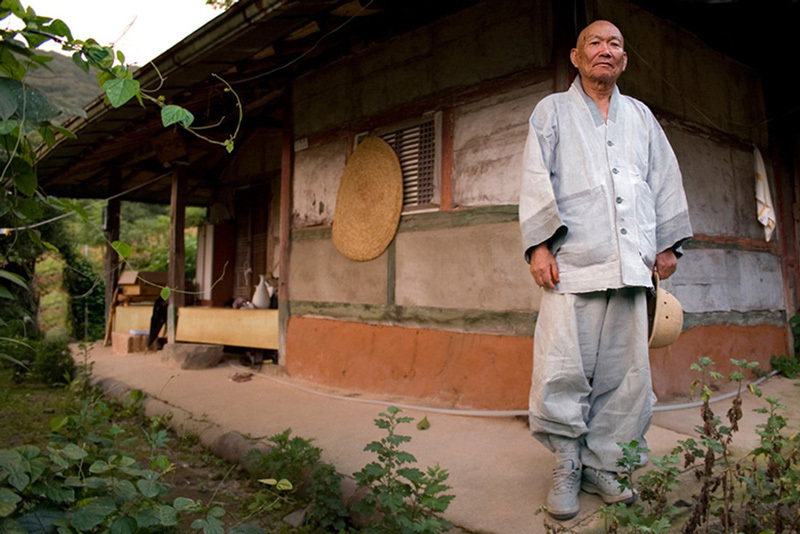 In the monasteries, it is common for monks and nuns to farm to feed the sangha. 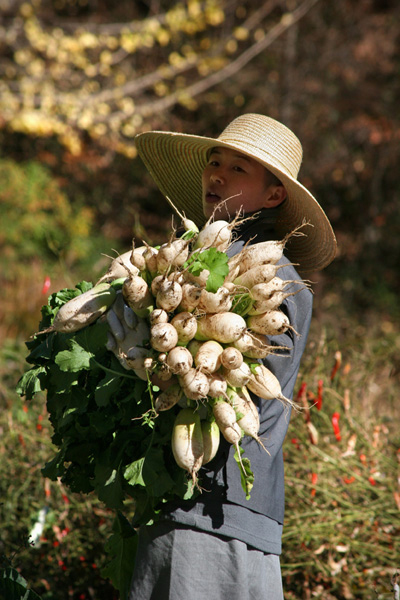 Collecting turnips to elaborate "Kimchi", the traditional Korean vegetable ferment. A gateless gate. 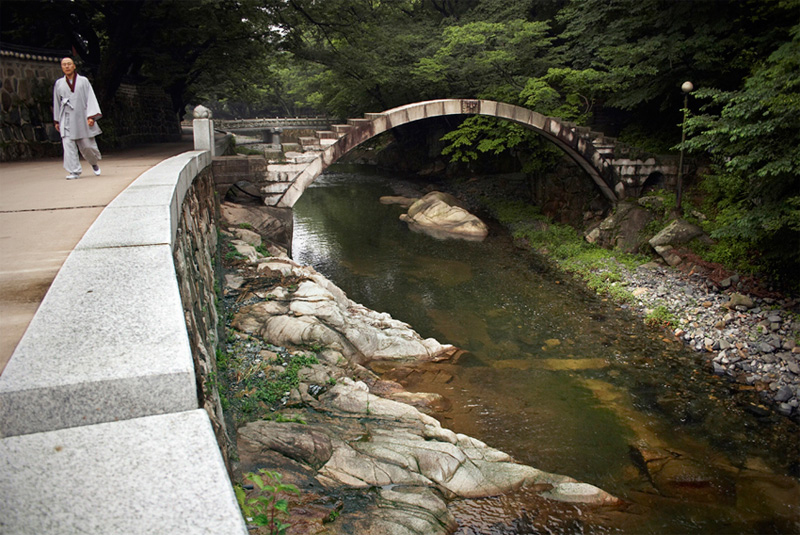 The Koan (Kon'gan in korean), it's an impossible question or history formulated by the master that provokes the “great doubt” in the Zen student. The objective is to break the polarities of consciousness. “Throw your logical mind overboard” -told me the master. 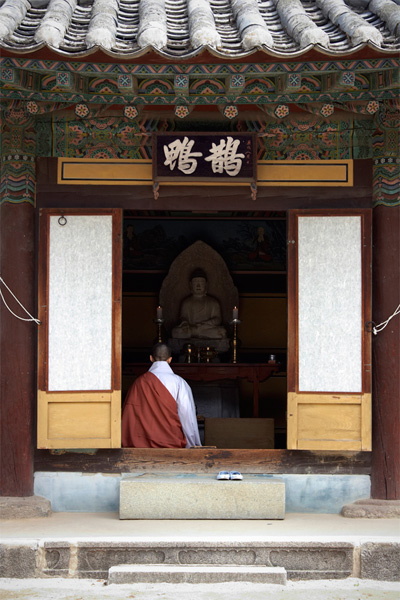 A novice, in formal pose, heads to the temple for offering food to the Buddha in Haeinsa Monastery. Each of us is a pottential Bodhisattva. The one who, motivated by great compassion, has generated a spontaneous wish to attain the state of perfect enlightenment for the benefit of all sentient beings. 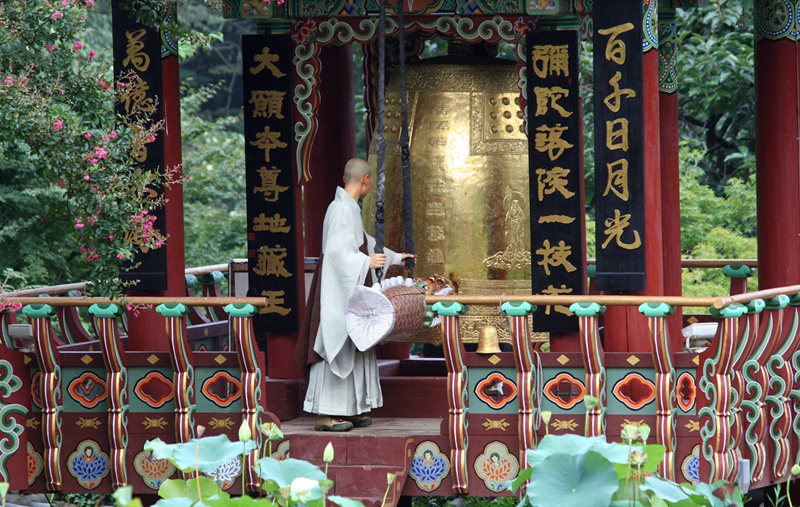 The ceremony bell, calls the awakening of consciousness from the beings of the air. 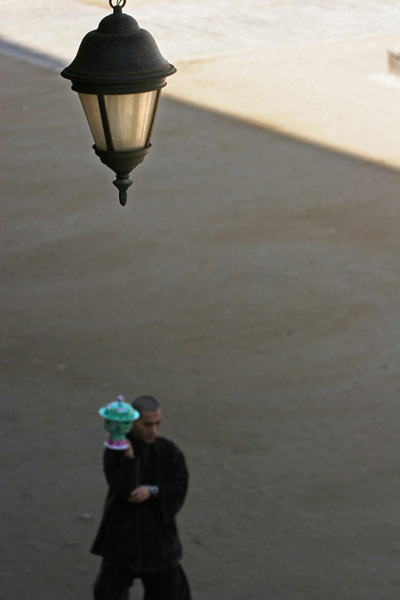 A novice monk crosses the main courtyard of Songgwangsa. 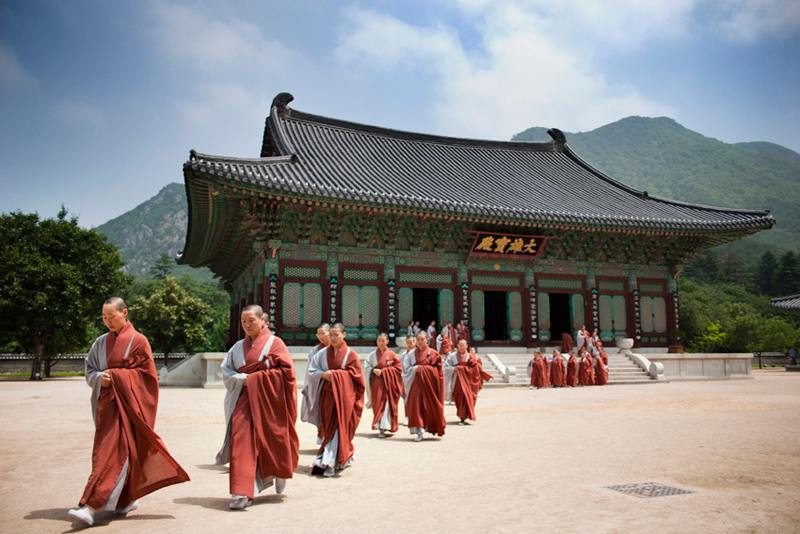 This Monastery it is considered as the greatest among the trio of the Three Jewel Temples of Korea representing the "the Buddha, the dharma, and the sangha". Break time in Tongdosa Monastery. A novice monk decides the route to be taken before starting his stroll. 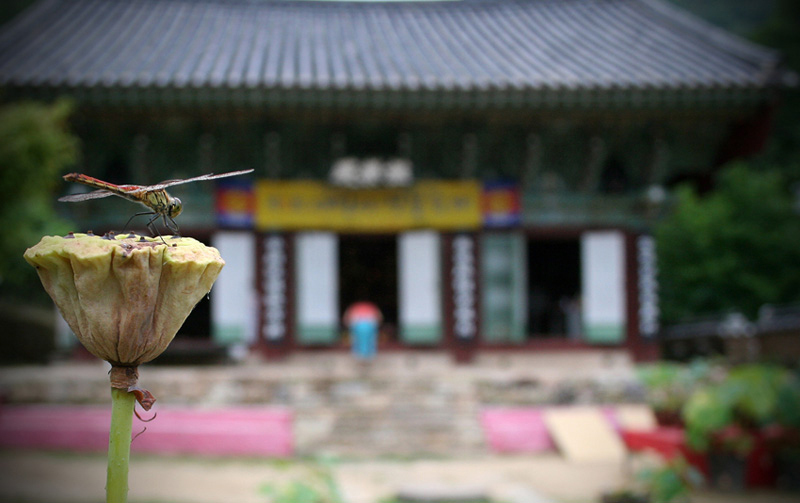 A dragonfly seems to observe a devotee as he bends down to greet the Buddha in Daewonsa. 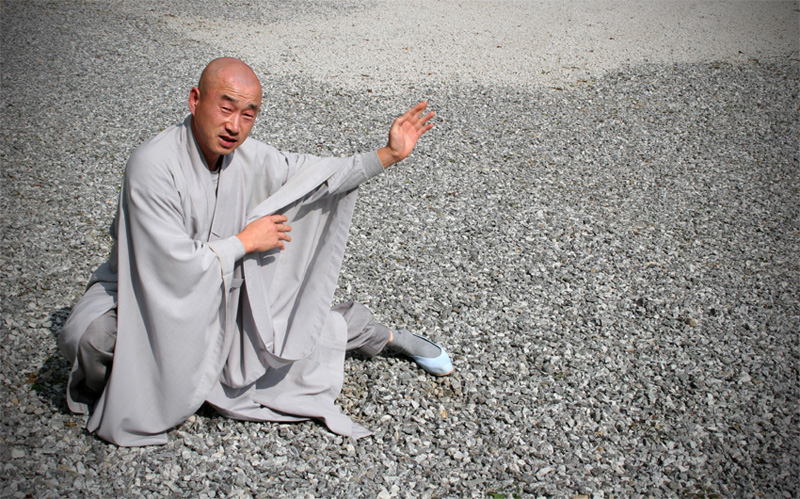 A monk training marcial arts in a dam near Daewonsa monastery. 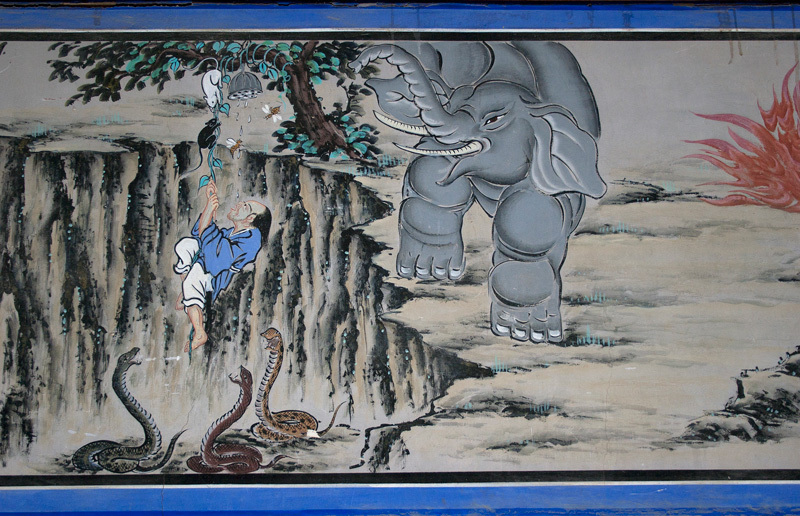 The Guardian painting in the main temple of Songgwangsa monastery. 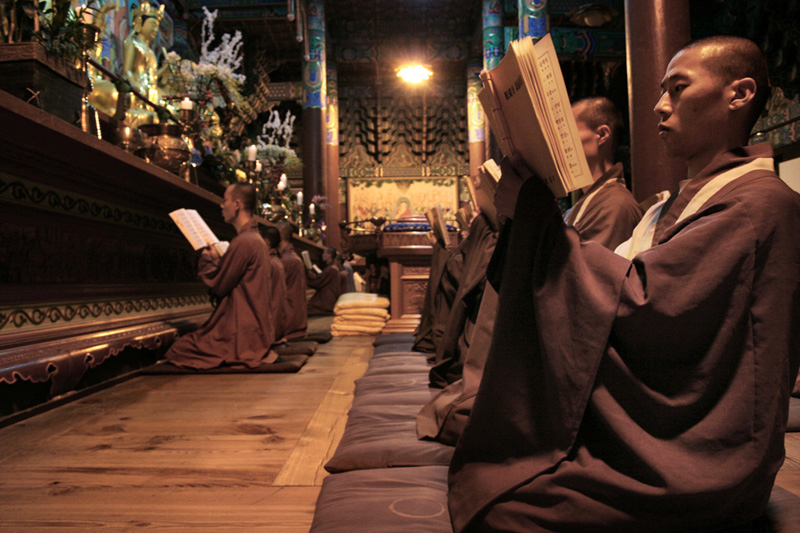 Meditation in a small chapel in Unmunsa monastery. 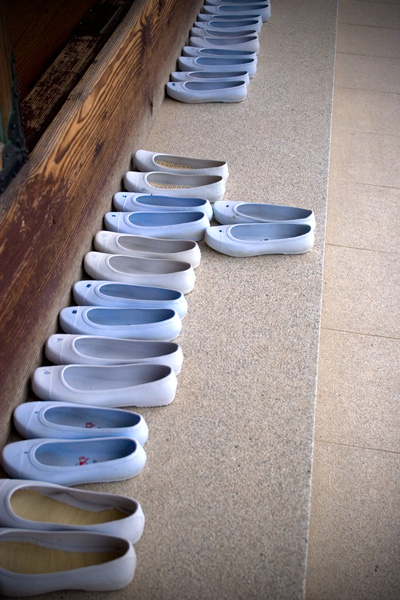 Gomushin shoes, made in PVC plastic, are commonly used in rural areas. In the monasteries is the ideal footwear, but due to its uniformity, each nun or monk must mark it in order to recognize them. Nuns going back to their daily routine after the ceremony in Unmunsa. No one saves us but ourselves. No one can and no one may. We ourselves must walk the path. - The Buddha. 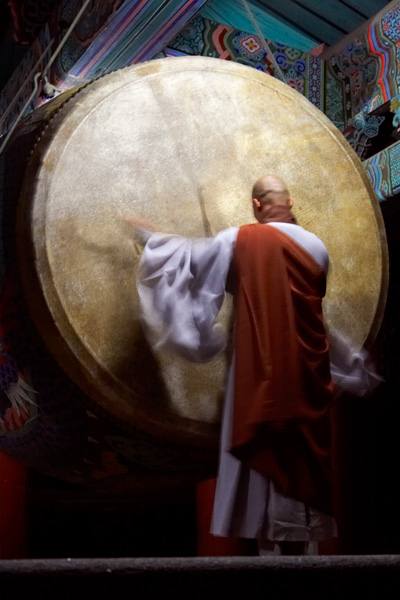 Monks are used to train martial arts because it's a good way to understand discipline, conditioning, perseverance, freeing the spirit and, of course, self-defense. Meditation at the Kugnakam temple. 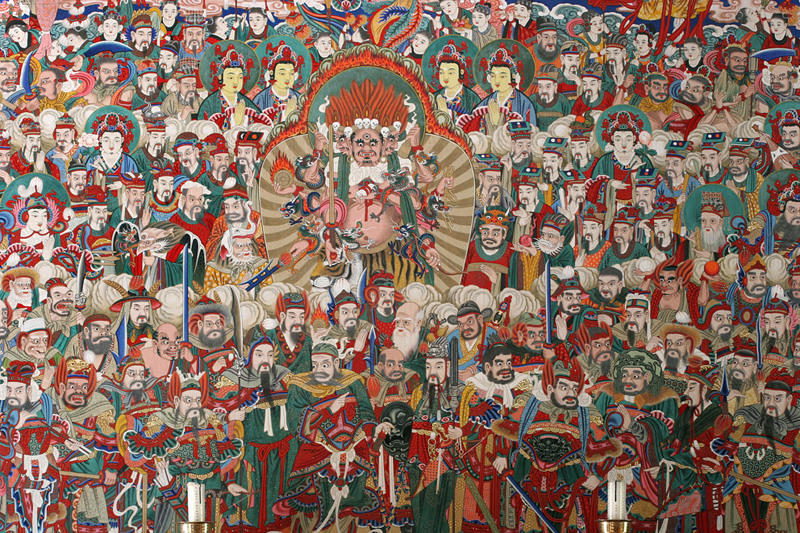 In the main hall of monasteries one usually finds the Four Heavenly Kings. 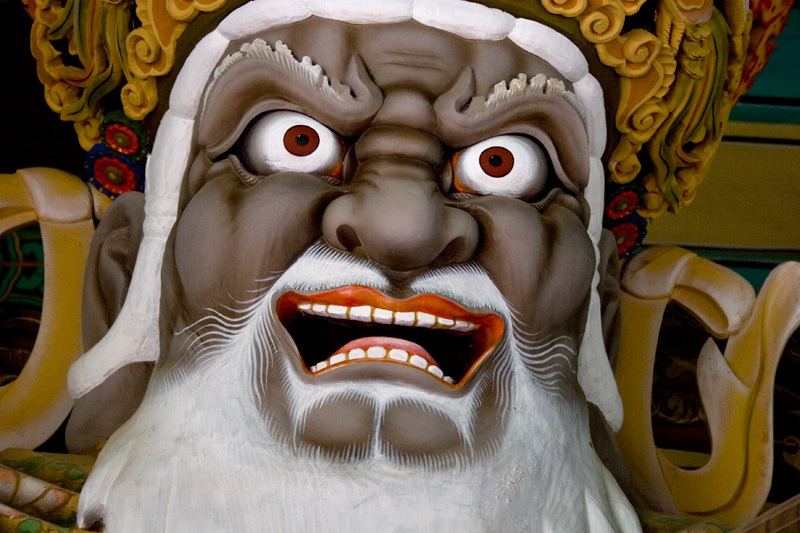 The Four Heavenly Kings are four gods, each of whom watches over one cardinal direction of the world. They are the protectors of the world and fighters of evil, each able to command a legion of supernatural creatures to protect the Dharma. An special occasion. 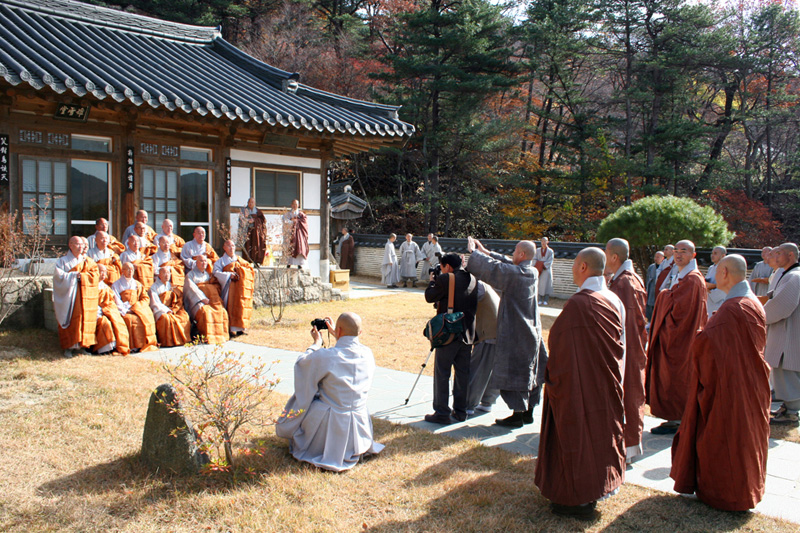 The Korean Zen hierarchy, gathered in a hermitage within the precincts of the monastery of Haeinsa. Frescoes are usually painted in monasteries remebering instructive buddhist parables. Parable of honey. 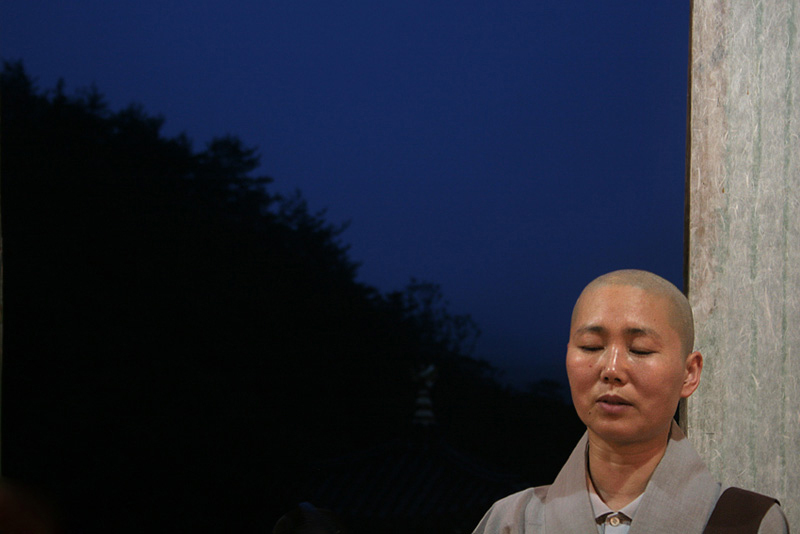 A nun greets a monk as he climbs the stairs in Haeinsa. 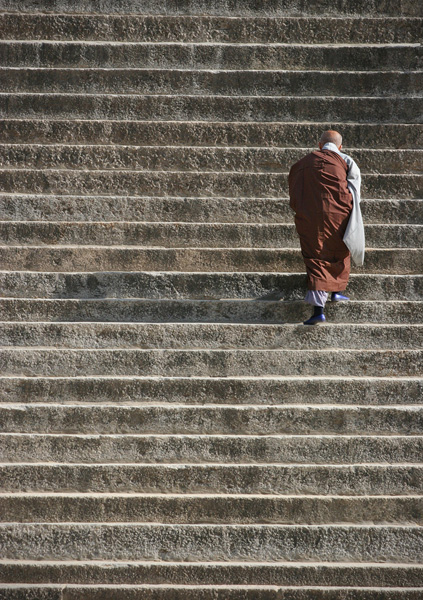 A monk ascends the steep stairs leading to the main temple of Haeinsa. 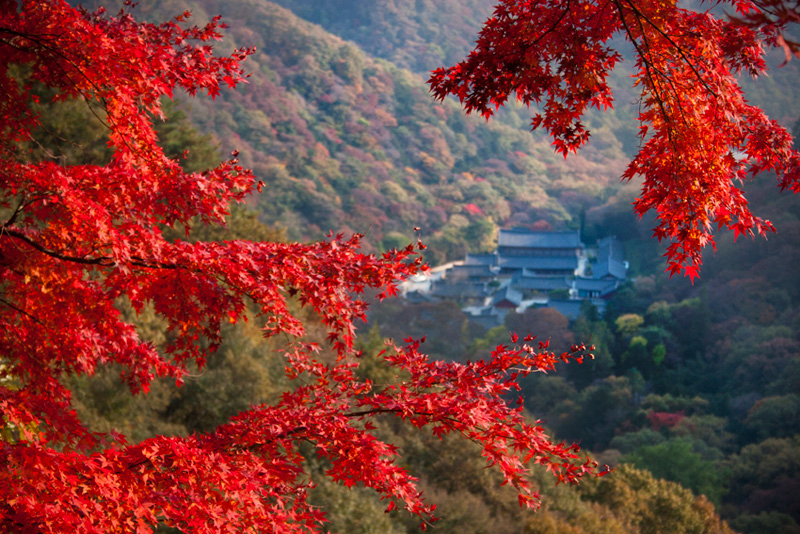 Usually, certain architectures in Zen monasteries, pose a test for the attention and concentration of those who visit these places. 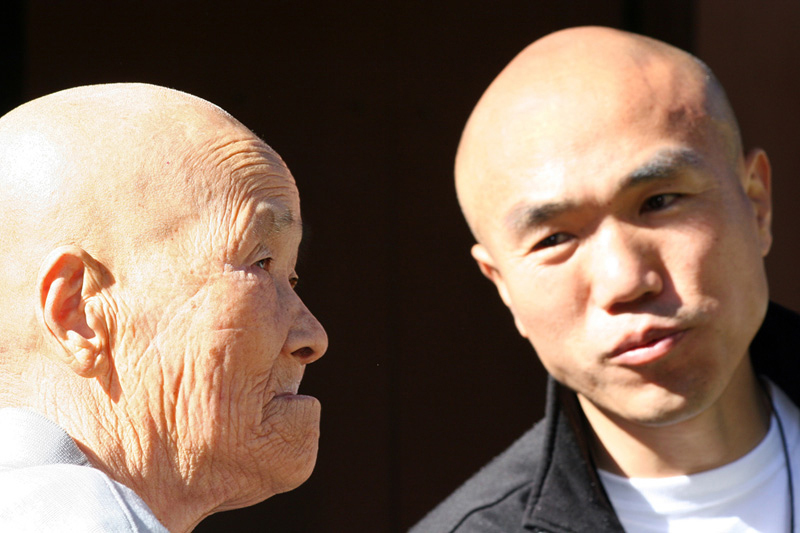 Old nun and young monk. Different generations, a single instruction. 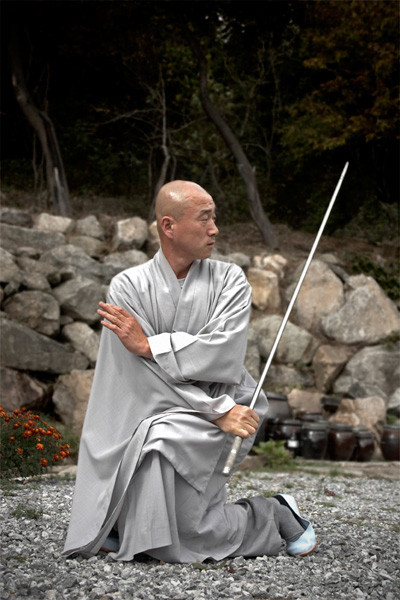 A monk of the Chogye order, martial arts training with a metal rod of 5 kg. 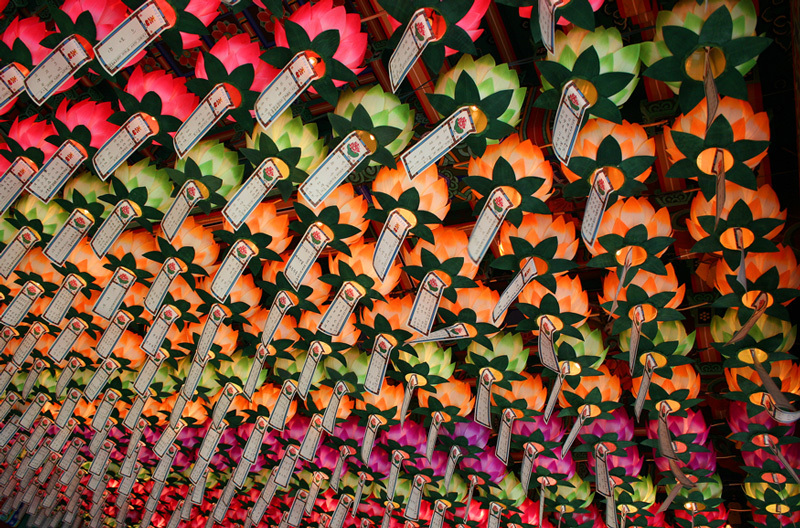 Tongdosa is one of the Three Jewel Temples of Korea, representing the Buddha . 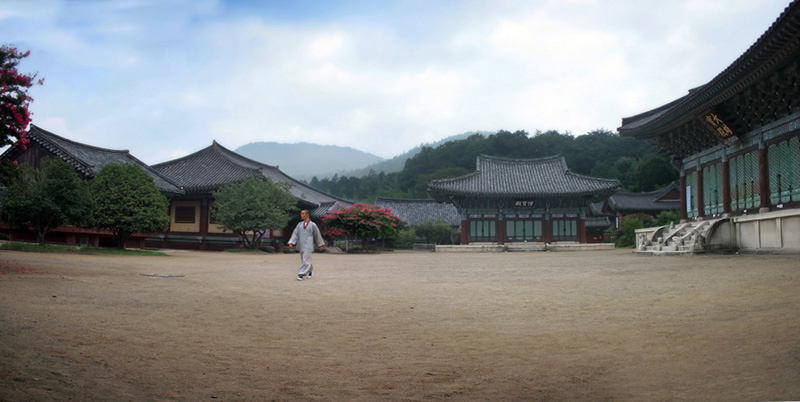 It is the head temple of the Jogye Order of Korean Buddhism. All forms, thoughts and conceptions are ultimately illusory. 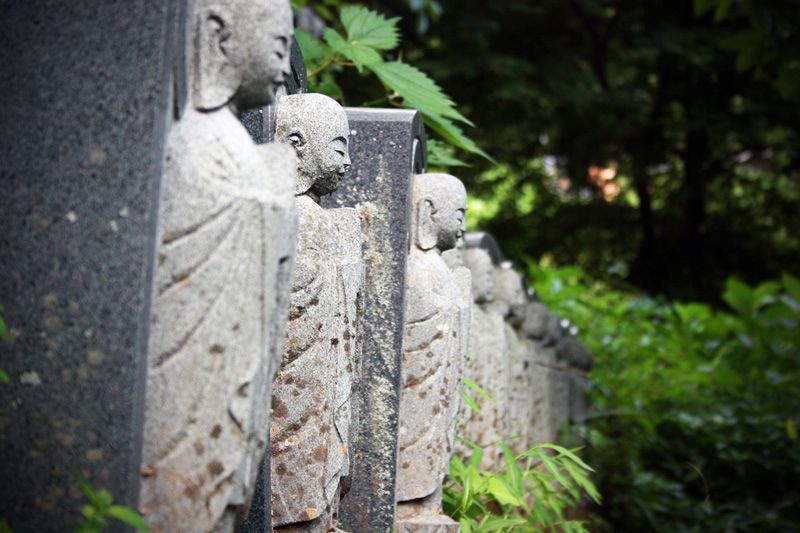 Zen teaches that true enlightenment can't be grasped through them; they must be set aside. The room of a monk, precise little. 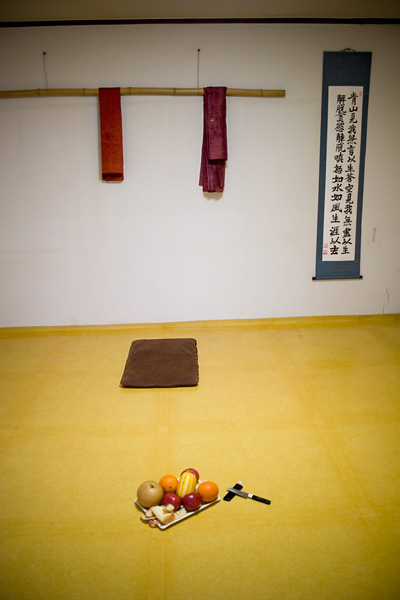 A bamboo pole to hang clothes and the meditation cushion. The Korean dormitories usually are equipped with underfloor heating system, thus is not a problem to sleep on a mat on the floor. 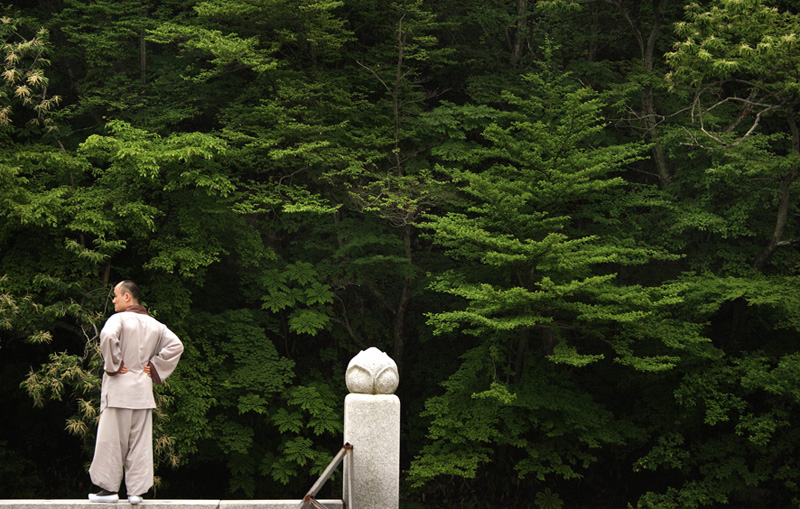 One method Buddhists use to cultivate awareness is meditation. The practice of meditation involves the development of a state of awareness whereby one is able to understand the true nature of reality. 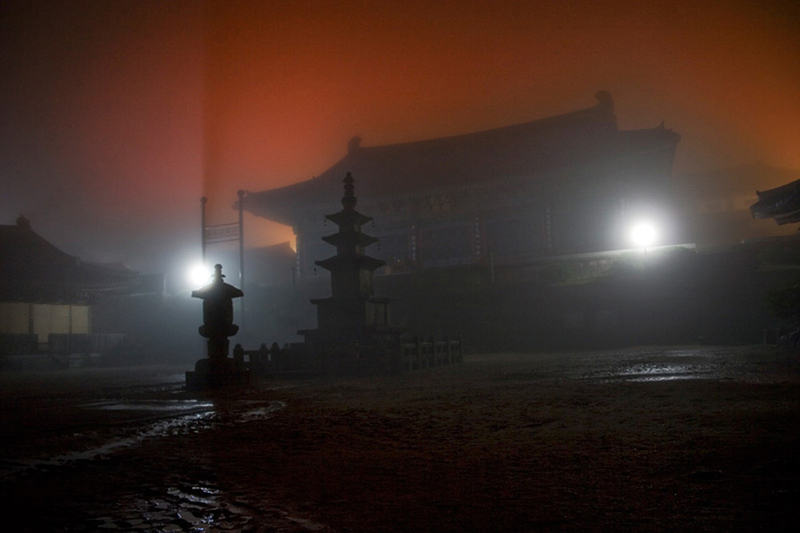 Before the dawn at Haeinsa main Temple. 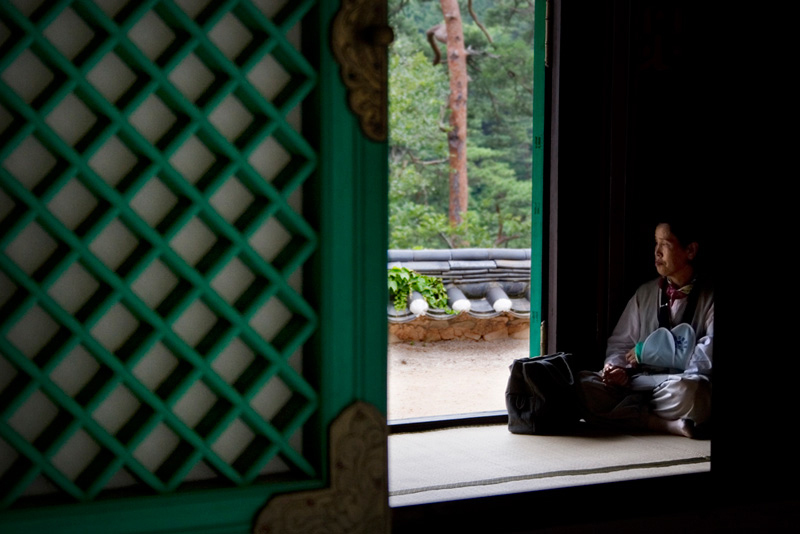 A nun chanting in the temple of Daewonsa. 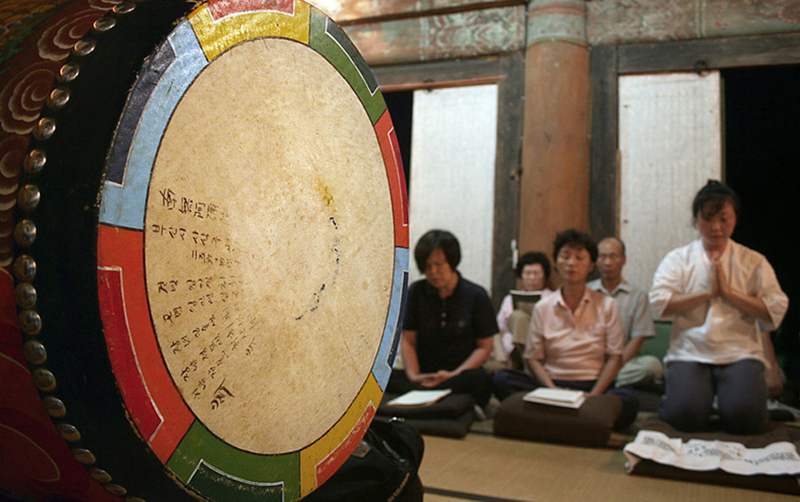 In Buddhism, chanting is the traditional means of preparing the mind for meditation. The lay Sangha. " Those who have confidence in the Awakened One have confidence in what is supreme; and for those with confidence in the supreme, supreme is the result". Itivuttaka - The Buddha. Go, go! Go beyond! Go far beyond! Recite to awaken! 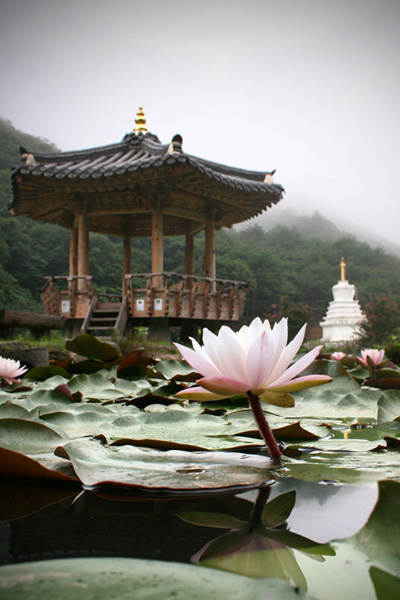 A lotus flower, symbol of enlightenment, grows in Daewonsa's monastery pond.